The Blacksmith and the Toffeemaker is a capacious pub on St John Street. 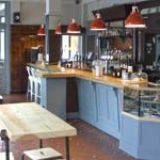 Focusing on British produce, the Blacksmith and the Toffeemaker offers rotating ales, gin, whisky and a food menu including hotpots, pies, roasts, bar snacks and deli options. Do you work at The Blacksmith and the Toffeemaker? What did you think of The Blacksmith and the Toffeemaker? 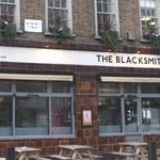 A capacious corner pub close to Sadler's Wells Theatre and City University, the Blacksmith and the Toffeemaker champions British ales, spirits, food and music in a handsome setting. There’s no shortage of good pubs in this part of town, however, such is the savvy nature of the local workforce, architects and creatives who you’d normally see frequenting pubs on Clerkenwell Green are making the journey up St John Street to check this reinvented boozer out (it used to be known as the Queen Boadicea). The space is divided into three interconnected rooms, all of which provide a mixture of comfy leather armchairs, spongy banquettes and high wooden tables and benches. The front section is buzzy and the closest thing to a lounge; the middle houses the bar and food counter and is probably the busiest as a result; the final section is partially shrouded by a thick curtain and they also use this area as a space for intimate gigs and DJs. The most eye-catching feature is the original shiny brown tiled walls, visible on the front of the building and inside, a traditional touch that shows it’s been around for a long time, and they’ve given it a contemporary flavour by employing a pale grey colour scheme across the frames and doors. Overall, it’s a good look, one that’s got loads more character than the bookcase wallpaper and cluttered shabby chic that’s still doing the rounds. Already packed on a Friday evening, the Blacksmith and the Toffeemaker attracts a good-humoured mix of local workers, students and residents. Conversation flows thick and fast and everyone in attendance seems intent on having a good time. It’s managed by two young guys who are massively passionate about the job, and the staff are all equally enthusiastic. It’s also worth noting that when the live music gigs take place (every Friday night), the dynamic of the place will certainly change considerably and the noise levels are sure to amplify in more ways than one. If you’re the sort of person who bemoans the fact that pubs are increasingly giving their floor space away to dining, then you’ll be pleased with the set-up here. 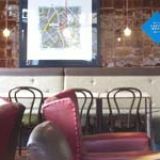 There’s no exclusive space for eating and the menu is an unpretentious mix of stodgy pies, scotch eggs and potted crab with the odd burger and lamb hot pot also making an appearance. 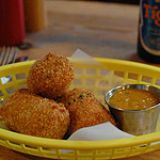 The scotch eggs are available in two varieties – classic (£4.00) and a smaller quail egg version (£2.00) with black pudding replacing the traditional stuffing in the latter. Both of these are very good although a little more meat to egg ratio inside the crunchy coating would make them even better. The best thing on the menu are the pies. Priced at a very reasonable £6.50, as soon as they arrive at the table you can smell the buttery goodness of their delicate, freshly-baked pastry. Inside you’ll find delicious combinations of slow cooked beef and potato or shredded rabbit and vegetable. Pair these with a side of creamy, moreish celeriac remoulade or the earthy fresh beets (£2.00 each) and you’ll be one very happy punter. Desserts (around £5.00) include a superb frosted carrot cake, a lovely selection of British cheese and a dense chocolate mousse served in a tumbler that should be renamed Death by Chocolate – it’s that intensely flavoured. Four well-kept ales – including Deuchars, Caledonian 80 Shilling and Theakston XB – are on offer. With so many ale specialists in the surrounding area, they haven’t got the scope to compete with geekier bars like Craft Beer Co, but there should be enough to keep most people content. Guinness, Heineken and Aspall’s are also visible at the bar. While their beer selection is restricted by a deal with the brewery, they’ve got a free reign on the spirit selection – and it shows. Gins from the likes of Sipsmith, Chase and Hayman’s, malt whisky from Laphroaig and Lagavullan, rum from Santa Teresa: it’s a connoisseur's choice. There’s also a short but well-selected wine list including a ripe and sticky Frentano Motepulciano D’Abruzzo. 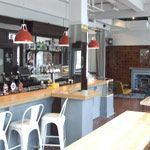 Refreshingly down to earth but serious about quality drinks and traditional pub grub, the Blacksmith and the Toffeemaker shows how it should be done. It’s the first pub from the two young guys behind it; on this evidence let’s hope it’s the first of many. This is a great addition to the Islington/Clerkenwell scene. Nice to see that the guys who took over back end of last year are still there, and have done a tasteful refurb retaining the integrity of the pub. I didnt think too much of the food before, but the cold counter and the pies are awesome, just what you want - nice pub grub but nothing too posh. Thsi is just what a local should be; welcoming, traditional, but pretty damn good at what it does...love it.